The global outdoor inflated leisure products market is anticipated to reach values of around $7 billion by 2023, growing at a CAGR of more than 12% by 2023. CHICAGO, IL, UNITED STATES, August 27, 2018 /EINPresswire.com/ — The market research report by Arizton provides in-depth market analysis and segmental analysis of the global outdoor inflated leisure products market by product type, category, distribution channel, and geography. Water inflatable products constitute around 3/4th of the total share and increasing construction of new swimming pools across emerging markets will have a positive impact on the global market. The growing popularity of luxury camping or glamping across the UK and Germany will contribute to the rising demand for innovative products in the market. The global outdoor inflated leisure products market is driven by the exponential growth in the tourism and hospitality industry. The increasing the number and quality of facilitation and locations for water leisure activities are generating a huge demand for water products included inflated products in the global market. The report considers the present scenario of the global outdoor inflated leisure products market and its market dynamics for the period 2018−2023. It covers a detailed overview of various market growth enablers, restraints, and trends. The study covers both the demand and supply sides of the market. It also profiles and analyzes the leading companies and various other prominent companies operating in the global outdoor inflated leisure products market. The rising demand for adventure sports among millennials and generation Y is contributing to the growing demand in the inflated leisure product market. The increasing awareness will result in the surge in demand for water sports like rafting, boating, kayaking, and other inflated swim gears like water slides, tubes, floats, and related products. The increasing stability of the economy and increasing disposable income is encouraging consumers to spend on traveling and exploring new destinations. The fast-paced and hectic lifestyle of consumers is increasing the preference of convenient, flexible, and portable products in the inflated leisure products market. The rapid changes in lifestyles will propel the demand for portable spas, air beds, air furniture, and related inflated products in the global market. Looking for more Information? Download Sample. This market research report includes a detailed segmentation of the market by product type, category, distribution channel, and geography. The global outdoor inflated leisure products market by product type is categorized into above-ground pools & spas, recreational products (water floats, play centers, and others), camping (air beds and air furniture), and sporting products (rafting tubes and floating island, boats & kayaks, and others (swim gears, water slides, and snow tubes)). The above ground pool & spas dominated the majority of the market share in 2017, growing at a CAGR of around 11% during the forecast period. Camping segment dominated the third largest market share in 2017, growing at a CAGR of over 13% during the forecast period. The other inflated outdoor products segment occupied a portion of the market share in 2017, growing at a CAGR of around 13% during the forecast period. The booming camping market in Europe and North America is propelling the growth of this segment in the global market. Inflated water products segment occupied around 3/4th of the total market share in 2017, growing at a CAGR of about 12% during the forecast period. Sports variety stores dominated around 1/3rd of the total market share in 2017. The geographical segment in the global outdoor inflated leisure products market is classified into North America, APAC, Europe, and ROW. North America led the total market share in 2017, growing at a CAGR of over 11% during the forecast period. Demand for water safety products in North America to drive the global outdoor inflated leisure products market. APAC to grow at an impressive CAGR of approximately 19% during the forecast period. The growing disposable income, westernization, and the impact of the social media are some of the major factors attributing to the growth of this segment in the global market. The air furniture, recreational, and sporting products are amongst the most popular products in the APAC region. The global outdoor inflated leisure products market is fragmented, and the top two players control over 70% of the total competition. The vendors are competing on the basis of lucrative pricing policies and the quality of the products. The companies are focusing on geographical, demographic and social trends, economic circumstances, and marketing efforts to sustain the intense competition in the global market. The launch of innovative and proprietary products that fit customer demands is helping players attract new consumers and gain a larger market share. 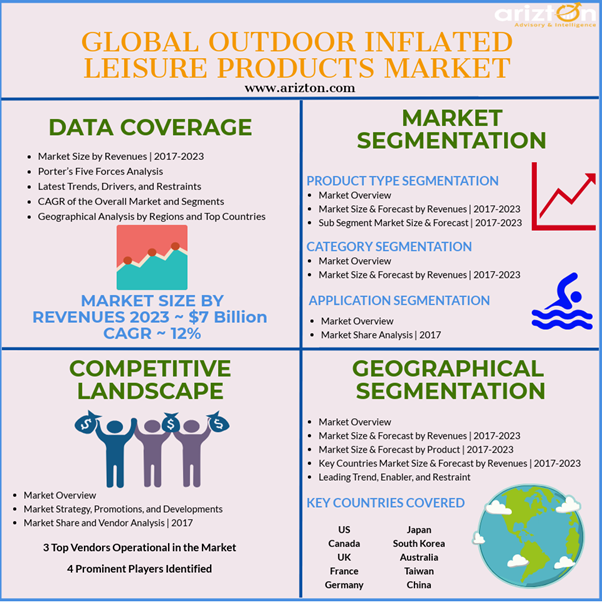 The continual investments to incorporate technological advancements, design, and product innovations will help vendors gain a competitive advantage in the global outdoor inflated leisure products market. Other prominent vendors include Tricon, Bigmouth Inc, BlueWave Products Inc, Swimline, Leisure Activities Co Ltd, Kololo, BK Leisure, Omega Inflatables, Jumporange, Funboy, Yoloboard, Yolloy Outdoor Product Co Ltd, Blastzone, General Group Co Ltd.
1. The analysis of global outdoor inflated leisure products market provides market size and growth rate for the forecast period 2018-2023. 2. It offers comprehensive insights into current industry trends, trend forecast, and growth drivers about the global outdoor inflated leisure products market. 4. It offers a complete overview of market segments and the regional outlook of the global outdoor inflated leisure products market.